So you’re going to be an engineer? But what’s next? For some opportunities seem endless, making it impossible to choose. Others are still looking for the perfect career path. Whatever position you might be in, good examples, best-practices and role models always give some sense of direction and insight into the possibilities that lie ahead of you. Fortunately Delft University of Technology (DUT) has some wonderful and successful alumni, and we want you to meet them! 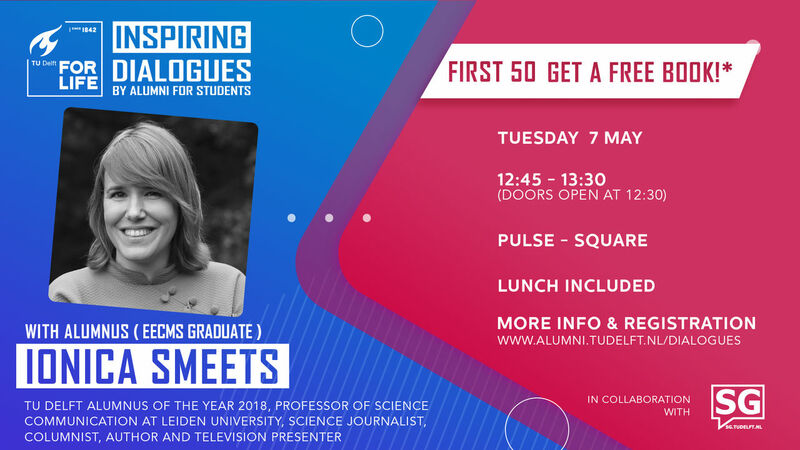 The Alumni Relations Office and Studium Generale have launched a new series called Inspiring Dialogues: interactive interviews with renowned DUT alumni giving you, the students, a chance to meet and talk to inspiring personalities that will help you skyrocket your career! After a successful kick-off, we continue the series with Ionica Smeets on 7 May 2019! Our Alumnus of the year in 2018 graduated from the Faculty of Electrical Engineering, Mathematics & Computer Science in 2005, and is currently Professor of Science Communication at Leiden University. The general public knows her for her popular science columns, blogs, books and television work. She has also written several books on science communication. During this interview Ionica shares her experiences as a student at our University and reveals how she became an outspoken advocate of science communication. It goes without saying that there’s room for questions, so come join us and prepare to be inspired! Sign up now and arrive early, because the first 50 students (present at the event) receive a copy of the book 'Het exacte verhaal' or 'Don’t be such a scientist' for free!